Do you sit at a desk all day? How about work in a sustained posture? I know I do (I’m a Newmarket chiropractor)…hunched over patients all day is not good for my posture, and is one of the causes of my “rolled-in” or “rolled shoulders” posture. I’m sure you have seen someone with this or know you have it yourself (look at yourself in pictures). Rounded shoulders are unsightly, it makes us look old just like forward head posture does. It can also create painful shoulder impingement, forward head posture, and muscle imbalance. The more devastating effects of rolled-in shoulders reach way beyond just pain. A study published by Harvard professor Amy Cuddy, revealed that a simple change in posture not only increased one’s confidence, but astonishingly caused a positive change in 2 important hormones. Yes, assuming a more dominant posture (e.g. sitting up tall with shoulders back) caused a 20% increase in testosterone and a 25% decrease in cortisol! Two very important hormones that influence your overall health by affected your metabolism, muscle mass, bone density, and even your immune response to name only a few. 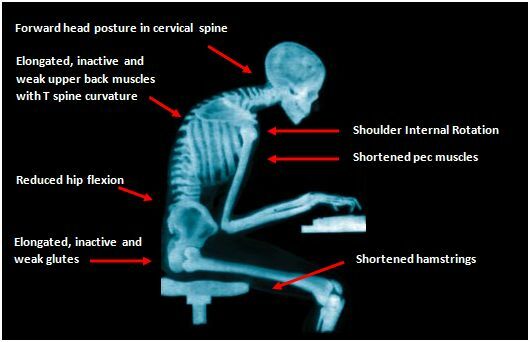 Think your posture doesn’t matter? Think again. Look, I know computers, video games (this affects kids equally), and desk jobs aren’t going away anytime soon. However, the evidence can no longer be ignored if you expect to live a long, healthy life. In my office I see just how much bad posture and alignment affect someone’s overall health. It’s time to take a stand and combat the effects of sitting at a desk too long. The best posture is your next posture – switch frequently! For every 30 minutes of sitting, you need to stand, move, or walk around for 5 minutes – yes you can do this, think bathroom break, water break, etc. Easy things you can start to implement immediately. Your nervous system, hormones, and overall health will thank you.